Hand Painted Gourd by artist Sandy Short of www.handpaintedgourds.com. Each gourd is signed and titled on the bottom. Makes a great ornament, gift, teacher gift, nature lover, etc. Hummingbird and yucca Hand–painted Gourd Christmas Ornament by artist Sandy Short www.handpaintedgourds.com. Original artwork. 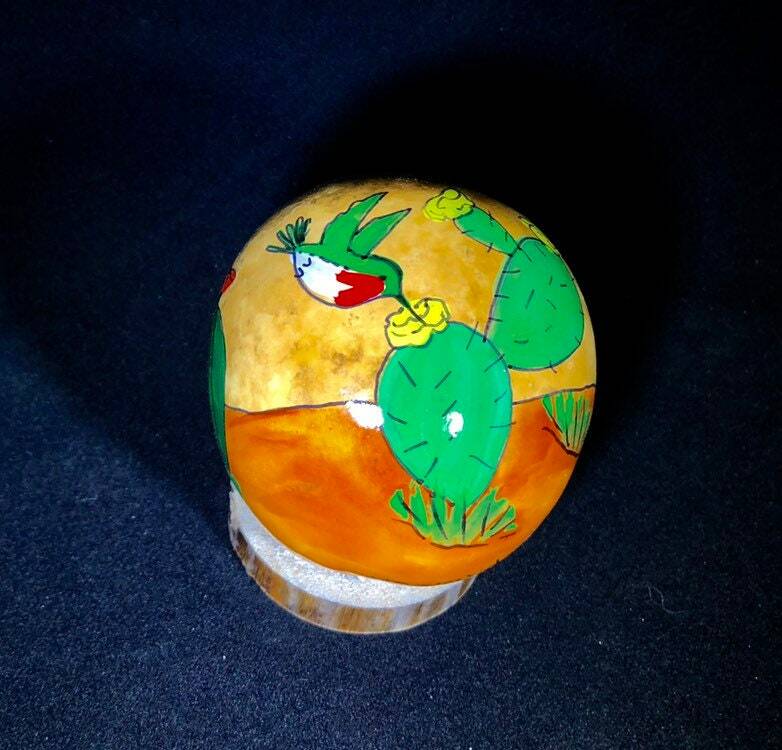 Desert cactus garden -Hand–painted Gourd Christmas Ornament by artist Sandy Short www.handpaintedgourds.com. Original artwork. Hummingbird Hand-Painted Gourd Christmas Ornament by artist Sandy Short www.handpaintedgourds.com. Original artwork on gourd w/ watercolor. Hot air balloon festival Hand–painted Gourd Christmas Ornament by artist Sandy Short www.handpaintedgourds.com. Original artwork. Hummingbird with dark pink flowers. Hand–painted Gourd Christmas Ornament by artist Sandy Short www.handpaintedgourds.com. Original artwork. Peacock ornament Hand–painted Gourd Christmas Ornament by artist Sandy Short www.handpaintedgourds.com. Original artwork. Saint Francis and birds ornament Hand–painted Gourd Christmas Ornament by artist Sandy Short www.handpaintedgourds.com. Original artwork. Red pow wow Hand–painted Gourd Christmas Ornament by artist Sandy Short www.handpaintedgourds.com. Original artwork. Light weight. Angel Hand-Painted Gourd Christmas Ornament by artist Sandy Short www.handpaintedgourds.com. Original artwork on gourd w/ watercolor.